A Year of Being Here: Tamara Madison: "Sequoia Sempervirens"
and the earth will add them to its riches. 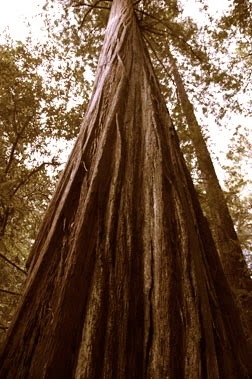 "Sequoia Sempervirens" by Tamara Madison. © Tamara Madison. Published here via poet submission. Photography credit: Untitled image by David Taylor accompanying a post entitled "Sequoia Sempervirens: Trial by Fire," at this link (originally color).